The 2017 property tax rates, calculated by the Cook County Clerk for more than 1,400 taxing agencies, were released today - the final step in the process before property tax bills are mailed. The full report can be found here. For the first time, the total of all property taxes billed for taxing districts in Cook County exceeds $14 billion. Last year the total tax billed in Cook County was $13.7 billion. At $14.4 billion, the total taxes sought by districts represents a 5% increase over the previous year, similar to increases in tax revenue for 2016 and 2015. In prior years, the total taxes billed increased approximately 1-2% annually. Similarly, the City of Chicago’s tax extension increased 5.1% and the total will again exceed $1 billion. Meanwhile, CPS will collect nearly $3 billion and the total taxes billed by CPS increased 8.3% over 2016. Average residential taxpayers in the City of Chicago and the North Suburbs should expect to see roughly a 3% increase in their tax bills while South Suburban homeowners will see an average increase of about 5%. Tax bills, which are due August 1, 2018, are calculated based on of the amount of money sought from taxing districts (the levy), the property’s assessed value, the state equalization factor, and the applicable tax rate. 1 Average composite tax rates: Actual taxes may vary within these areas based on actual property values and tax rates. 2 Tax bills based on an average single-family residence (including condos) with market value of $224,500 in Chicago, $299,100 in north suburbs, and $187,500 in south suburbs (reassessed from $163,000 in 2016). 1 Average compositetax rates: Actual taxes may vary within these areas based on actual property values and tax rates. 2 Tax bills based on sample commercial properties with the same market values as the previous examples. 3 Increased tax amounts result from a variety of factors including increased levies and changes in assessments in different areas of the county. Property assessments in Cook County are set by the Cook County Assessor and finalized by the Cook County Board of Review. These assessments are equalized using the Illinois Department of Revenue’s (IDOR) state equalizer to ensure uniform assessments among counties.1 This equalized assessed value, less applicable exemptions, is the taxable value of property. Senior Freeze Exemption (Taxable value “frozen” after age 65): Income eligibility requirement increased from $55,000 to $65,000. 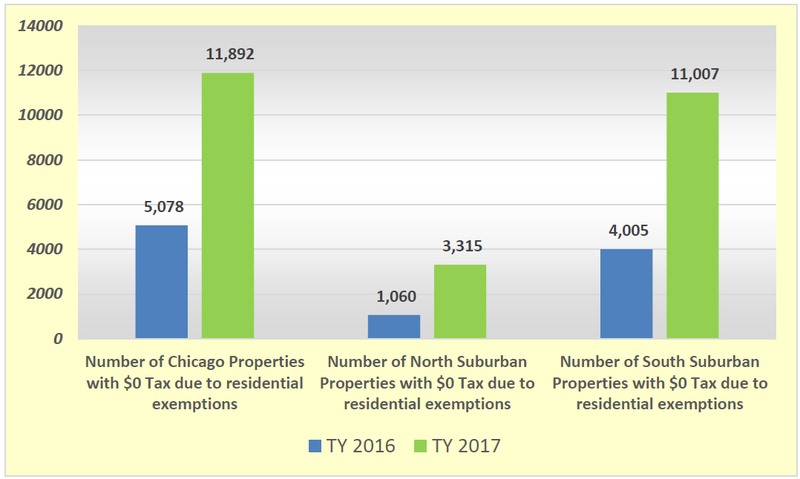 The impact of these exemption increases is to shift more of the property tax burden in Cook County to non-residential property such as industrial or commercial entities or for residential properties which are not eligible for property tax exemptions. A non-reassessed property would typically see an increase in taxable value in line with the change in the state equalizer, which increased 5.7% from 2.8032 to 2.9627. The increase in the homeowner exemption will offset this increase to some degree. 1 The increased residential and senior exemption amounts produce a shift in the tax burden to non-residential properties and all properties may experience a slight tax rate increase. Increases in overall taxable value in the Southern Suburbs, where properties were reassessed, together with changes to the income requirements related to the Senior Freeze exemption, have resulted in large increases in the amount of taxable value reduced due to this exemption. 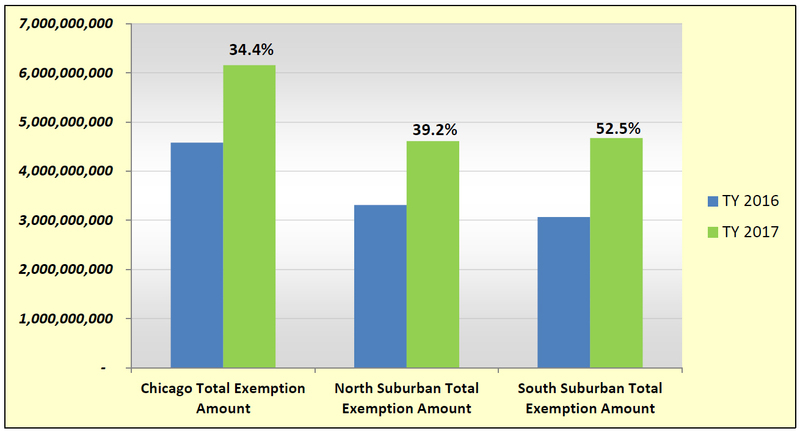 Note: When EAVs rise sharply, as happened in the Southern Suburbs this year, more taxpayers become eligible for the Senior Freeze Exemption and exemption amounts can increase sharply. 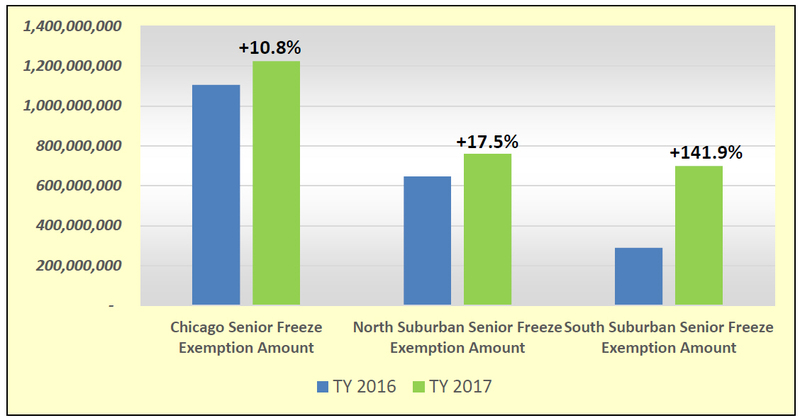 For tax year 2016, Senior\ Freeze Exemption amounts increased 136% in the Northern Suburbs, which were reassessed that year. Statutory increases to residential property tax exemptions also resulted in an increased number of properties that are not required to pay any property tax for tax year 2017. 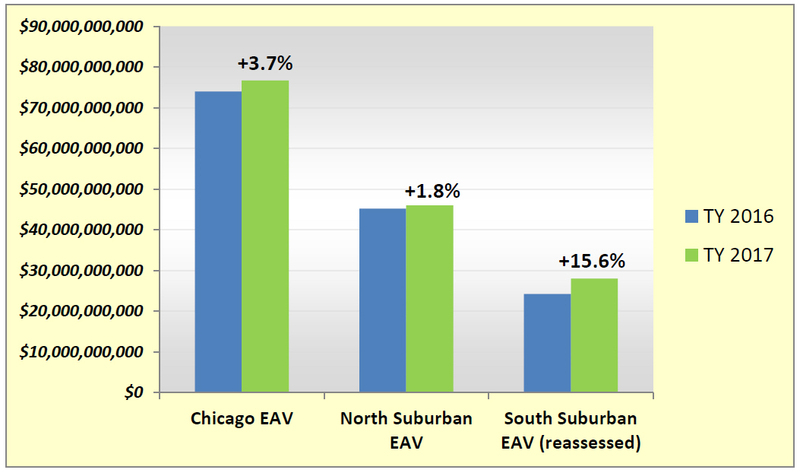 The overall equalized assessed value (EAV or taxable value) in Cook County increased by 5.1% this year, largely due to the reassessment of the South and West portions of the County which saw assessed values increase by 13.5%. When added to a 5.7% increase in the state equalizer, offset by a 52.2% increase in residential tax exemptions, taxable values in the southern suburbs increased an average of 15.6%. The Northern Suburbs, which were not reassessed, experienced a 1.8% increase, which includes a 39.2% increase in residential property tax exemptions. The City of Chicago, which was also not reassessed, saw a 3.7% increase in EAV, which includes a 34.4% increase in residential property tax exemptions. Due to the lower property value base in the Southern Suburbs, property owners typically see higher tax rates than those in the City or the Northern Suburbs which have a larger value base. As taxable values increased in the Southern Suburbs due to the triennial reassessment, most tax rates in that area have gone down this year. A lower tax rate applied to a higher taxable value may still result in a higher tax bill. Individual results will vary. Taxing districts such as schools and municipalities must provide services which are funded in large part by property taxes regardless of this difference in taxable value. Thus, tax rates tend to be significantly higher in the more depressed areas of the County to meet district needs. For example, the highest tax rate in Cook County is found in the Village of Ford Heights where property owners pay a tax that is nearly 34% of their taxable value, compared to property owners in the City of Chicago or the Northern Suburbs where some tax rates are approximately 7% of taxable value. The following table illustrates differences in taxable value and tax rates for several school districts. As Clerk Orr has noted, “the Illinois property taxes system is regressive and disproportionately impacts people in poorer regions. The overreliance on this mechanism of funding local government compounds existing inequities.” Clerk Orr has consistently called on the state to adopt a fairer income tax that promotes less reliance on property taxes. Tax rates are calculated by dividing the amount of money each taxing district requested in their levy by the total taxable value within each district. A taxing agency or district is a body of government such as a school district, library, or municipality, which levies real estate taxes. The tax rates of all districts that service a particular property are compiled to create the composite tax rate for that property. Typically, when taxable values increase, taxpayers will see a corresponding reduction in tax rates. City of Chicago taxpayers, however, are seeing rates increase of approximately 1.7%, due in large part to increased levies from the Chicago Board of Education and the City of Chicago. The City increased its levy by $53 million this year as the third segment of a planned four-year tax increase that began in tax year 2015. Additionally, the Illinois General Assembly approved a $154 million increase to the CPS teachers’ pensions which took effect this year. The Property Tax Extension Limitation Law (PTELL), also known as the “Tax Cap Law” limits the increase in revenue that qualifying districts may collect to the rate of inflation. In most cases, districts this year were limited to an increase equal to the 2017 Consumer Price Index (CPI) of 2.1%. This allowed taxing districts to levy additional revenue, where previously they were limited to an increase of .7% for the 2016 tax year. Home rule districts, debt obligations, special purpose funds, and value derived from new property and terminated Tax Increment Financing Districts (TIFs) are exempt from this limitation.